Bhuvneshwar Kumar (born 5 February 1990) is an Indian international cricketer. He plays for Uttar Pradesh in domestic cricket, and Sunrisers Hyderabad in the Indian Premier League. Kumar is a right-arm fast-medium bowler who swings the ball both ways efficiently, especially adept at creating late swing, and a useful lower order right-handed batsman. His talent was first noticed in a T20 match against Pakistan, where he successfully took a three-wicket haul. In the ODI series that followed, he bowled a magic delivery to Mohammad Hafeez - cleaning up his stumps and thus ensuring his place in the Indian squad for the rest of the series. He later proved to be a match winner for India. 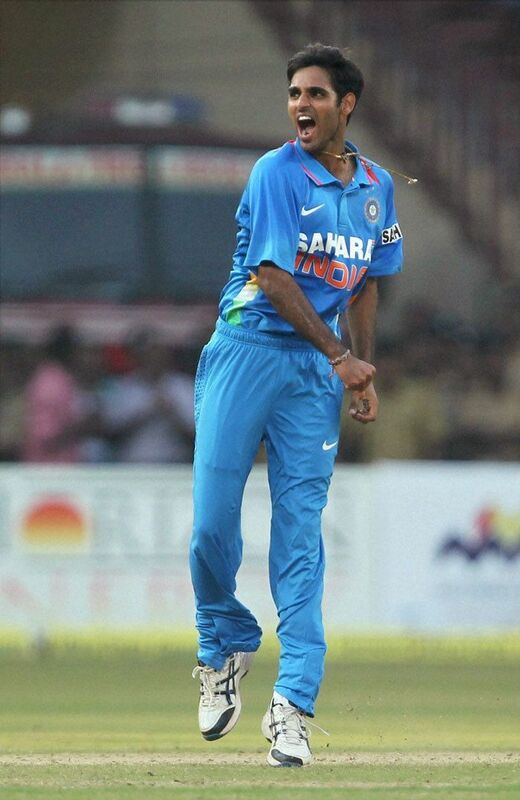 Bhuvneshwar Kumar was born in Meerut on 5 February 1990, to Kiran Pal Singh and Indresh. His father was an ASP with the Uttar Pradesh Police and his mother, a homemaker. He belongs to village Luharli near Gulaothi in Bulandshahr. It was his sister Rekha Adhana, who encouraged him to play cricket and took him to his first coaching centre when he was 13. Kumar plays for Uttar Pradesh in domestic cricket. He has also played for Central Zone in the Duleep Trophy. Kumar made his first-class debut at the age of 17 against Bengal. In the 2nd semi-final against North Zone, Kumar took one wicket with an economy rate of 3.03. Although being a lower-order batsman, he scored 128 off 312 balls surpassing all the scores of his team mates and maintained a partnership with four batsmen. He was consequently awarded the Man of the match. In the 2008/09 Ranji Trophy final, he became the first bowler to dismiss Sachin Tendulkar, rated as India's greatest batsman, for a duck in first-class cricket. Kumar was included in the playing eleven of the first T20I match against Pakistan at Bengaluru following Parvinder Awana's poor showing in the previous series against England. He took 3 wickets for 9 runs in 4 overs in the match with an economy rate of 2.25. He took the wickets of Nasir Jamshed, Ahmed Shehzad and Umar Akmal. He opened his account in ODIs by taking a wicket in the very first ball that he bowled, dismissing Mohammad Hafeez of Pakistan. Kumar's debut wickets in T20Is, ODIs and Tests have all been bowled and is the first ever bowler to do so. In his debut Test series, he took 6 wickets in four matches against Australia in the 2013 Border-Gavaskar Trophy. He also had a record partnership with M. S. Dhoni for the 9th wicket in the first Test of the series. He has the highest score by an Indian number 10 on debut, 38. Kumar made his debut on 22 February 2013 against Australia during 1st test of Australia Tour to India in 2013. He was given the test cap by Ishant Sharma. He struggled to take any wickets in the first innings, mainly because it was more of a spin track rather than a swing and pace favorable pitch. Later, in the same test during India's batting, he helped set up a massive partnership of 140 runs for the 9th wicket with M. S. Dhoni. This partnership helped India establish a lead of 266 runs. During this course he was part of a few records and was given a standing ovation by the team and the crowd once he got out with a score of 38 runs (off 97 balls). When India went to field in the second innings he didn't get a chance to bowl and went wicketless on his debut. In his second test match he got three wickets getting Australia's David Warner, Ed Cowan and Shane Watson out. In the first innings of his second test against Australia, Kumar went wicketless, mainly because he could not get the ball to swing and was given very few overs (6 in a spell and then a single over). But in the second innings, he took the important wickets of Shane Watson, David Warner and Steven Smith. Claiming 6 wickets at an average of 22.83 and an economy rate of 3.91. Kumar was included in the "Team of the tournament" of the 2013 Champions Trophy. On 9 July 2013, he posted career best figures on 4-8 against Sri Lanka in the Tri-Nation tournament, which India would go on to win. He was awarded the "Man of the Series" in this tournament after he finished the series with most wickets. Kumar proved that he could be handy with the bat in Test matches when he scored 2 consecutive half centuries in the 1st test of the Investec Test Series 2014 against England with scores of 58 and 63*. He also had his 1st five wicket haul in his test career in the first innings of the same match. Kumar had his second five wicket haul in the next match of the same series and got his third fifty in Test in the same match. He became the first Indian number 9 player to get three fifties in one series, even going on to add career-best bowling figures of 6/82 versus England at Lord's. Despite India losing the series 1-3, he was named the Indian Player of the Series. Following his good performances in the 2008/09 Ranji season, he was handed an IPL contract by Royal Challengers Bangalore. In 2011, he was signed by Pune Warriors India. After the dissolution of the PWI team, he was picked up in 2014 by Sunrisers Hyderabad. In 2016, he contributed towards an impressive season after winning IPL 2016 with Sunrisers Hyderabad, he also won the Purple Cap that season for picking up the 23 wickets which was the most. He took five wickets in a match for SRH against Kings XI Punjab in IPL 2017. This score of 38 is the highest by any Indian batsman coming at 10th position. He surpassed Paras Mhambrey to achieve this feat. He faced the most number of balls (97) by a debutant coming at number 10 to bat for India, surpassing Ravi Shastri(54 balls). He also stayed at the crease for the most time by a debutant coming at number 10 to bat for India. He scored a half-century of each innings of the 1st test of Team India's tour of England in July 2014. He was second player to do so, batting at number 9, after Peter Siddle. This is the highest partnership for the 8th wicket by India against Sri Lanka. This is also the highest partnership for the 8th wicket for India against any team in ODIs.